Die FINANZ und WIRTSCHAFT schreibt dazu: „Die obige Grafik des Anlageberaters Edelman Financial Services zeigt, dass seit dem Zweiten Weltkrieg nur der Aktienboom in der ersten Hälfte der Fünfzigerjahre kräftiger war: Damals stieg der S&P 500 fast 270%. Auch was die Dauer betrifft, erleben wir derzeit einen der grössten Börsenzyklen überhaupt. Die Hausse hält mittlerweile 94 Monate an. Noch länger tendierten die Aktienkurse einzig während des Internetbooms der Neunzigerjahre mit 114 Monaten aufwärts. Wie in jeder Hausse werden die Kursavancen eines Tages enden. Wann, kann freilich niemand sagen. Auch in diesem Zyklus werden Investoren aber zusehends übermütig und vertrauen darauf, dass es dieses Mal am Schluss nicht so schlimm wird wie beim letzten Mal. Die Grafik zeigt allerdings, dass gerade die letzten beiden Kursstürze besonders ausgeprägt waren: In den Jahren 2000/2002 und 2007/2009 verlor der S&P 500 jeweils fast die Hälfte an Wert. Das war in der Nachkriegszeit sonst nur während der schweren Baisse Mitte der Siebzigerjahre vorgekommen.“ – bto: Käme es zu einem erneuten Kurssturz in einem Rekordumfang, stehen das gesamte Wirtschaftssystem und die politische Ordnung vor einer existenziellen Krise. „Ultimately, extreme valuations, the lack of risk premia, and a lack of responsiveness to tail risks are merely symptoms. The real question is what the skewed incentive structure resulting from that backstop has done to the fabric of markets after so many years. To our minds the answer is that trades and strategies which explicitly or implicitly rely on the low-vol environment continuing, are becoming more and more ubiquitous.“ – bto: Gemeint ist, dass die Ruhe, die auch von den Notenbanken erzeugt wurde, auch wieder enden kann und damit auch die Grundlage der Spekulation in einigen Märkten. „Realised historic vol is de facto an exogenous input to much of the risk management framework that underpins modern finance. With lookbacks extending a few years, an extended period of market stability reduces VaR measures and improves Sharpe ratios. Both allow / encourage investors to take more risk – driving valuations higher and vol lower still, creating a self-reinforcing dynamic. Intuitively, returns should follow flows – money is deployed and the asset price goes up. But in the real world the causation works the other way.“ – bto: Die Modelle der Investoren sind rückwärtsgerichtet und genau deshalb ungeeignet. Je mehr die Modelle dominieren und das Gehirn abgeschaltet wird, desto größer das Risiko. „Long periods of one-way markets breed survivor biases. The fund manager with lots of beta outperforms, the cautious fund manager underperforms. Either the latter gets on the bandwagon or soon enough outflows from the fund will ensue. Over time, fewer and fewer ‚critics of the regime‘ are left standing.“ – bto: was zusätzlich die Trends verstärkt und damit die Gefahr von Trendwenden. „(…) the closer spreads get to the lower bound, the more explicitly being long credit in itself becomes a short-vol position. With less and less upside remaining, owning credit risk become a question of generating a small amount of carry (or premium) for taking future downside risk – essentially, akin to selling a put option.“ – bto: Eine Put-Option an der Spitze des Marktes zu schreiben, ist hoch riskant. „When the conventional asset class of choice no longer offers a ‚decent‘ return potential, money looks to the next one on the quality spectrum for a pickup. IG funds holding BBs and AT1. DM funds buying EM debt. European and Asian funds holding more and more $ fixed income. Corporates moving their liquidity from money markets to short-dated IG credit funds. Mandate creep in the investment criteria. Even synthetic structured credit is making something of a comeback. The list of tourist trades goes on and on. Most of these too are predicated on the status quo – if volatility and risk premia were to rise, retrenchment back towards the original / natural asset allocation would be swift and uncompromising.“ – bto: was für eine schöne Beschreibung der Sorglosigkeit an den Märkten! 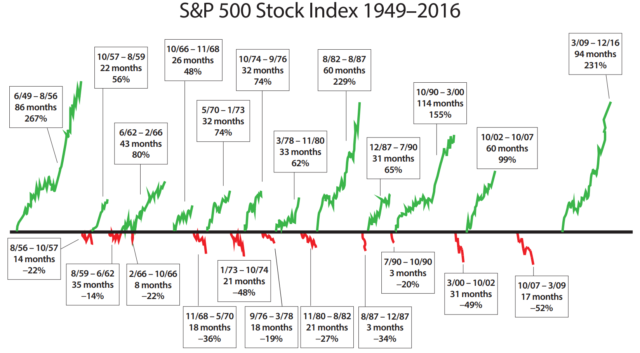 „You could rightly argue that many of these factors are generic to every bull market. The fact that volatility clusters is exactly because of these (and other) selfreinforcing dynamics. But the implicit ceiling on vol / cap on downside from the central bank backstops has, in our view, allowed them to run for much, much longer than would have been possible in a market operating on its own devices.“ – bto: Und das macht es so gefährlich! 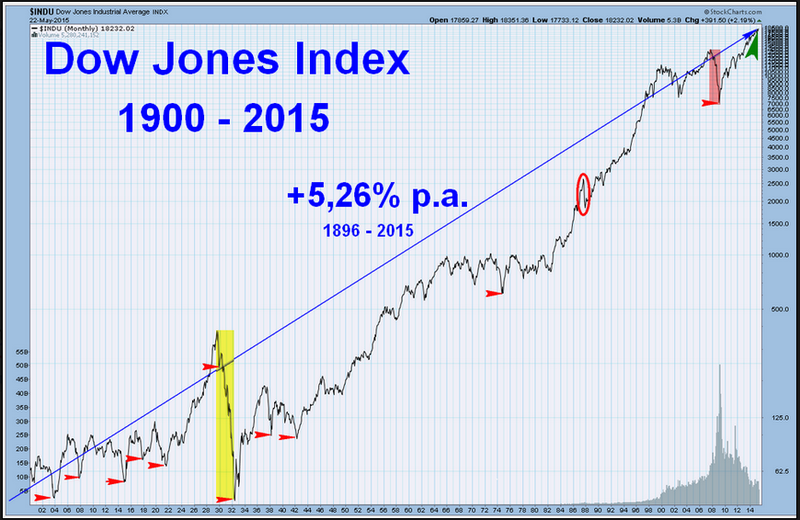 „You could argue that there is nothing to worry about as long as fundamentals remain strong. But those looking at the economic data, corporate earnings or leverage trends to indicate the next turn in markets are looking in the wrong place, if you ask us. Over the last 50 years, only 2 out of 19 corrections in US credit were led by a recession. 12 had no overlap with a recession at all. In half the corrections, there wasn’t even a discernible turn in the leading economic indicator beforehand. Plainly, there is a long history of market corrections being triggered by other factors than fundamentals – Black Monday in 1987 and the correlation crisis in 2005 are two obvious examples.“ – bto: Es genügen Probleme, an die wir gar nicht denken. Das Auto kommt aus einer ganz anderen Richtung. „Surely, if one could just get a slightly better call on the next trigger, then it’d be possible to get out just in time before everyone else jams the exit? We don’t dismiss the importance of triggers. Indeed, when you look back at the last fifty years, nearly every major correction in credit can be associated with a triggering event (Figure 28). With hindsight everything is easy.„ – bto: Und deshalb ist es so gefährlich! „We are sceptical that hunting for the next trigger is worth the effort. If a trigger seems obvious, then it’s probably obvious to everyone and chances are it will be too late. Triggers are often latent – the long-term problem is obvious, but it is ignored until suddenly it explodes without much warning (think the Greek sovereign debt crisis). Multiple factors often have to combine to create a triggering event – the GFC wasn’t just about sub-prime, it was about excessive leverage, inadequate regulation, unchecked financial innovation, misaligned rating methodologies, inadequate backstops and a host of other things.“ – bto: Und genauso ist es heute wieder!! Central bank asset purchases are set to be the smallest in a decade (Figure 29). A $1tn of incremental demand versus 2017 is needed from private sources. At least in the US, the opportunity cost of not being invested in credit (i.e. the yield differential to 3m LIBOR) is likely to be the smallest since 2007. The perception of a backstop has facilitated a multitude of trades and strategies that are contingent on a low level of volatility in an increasingly crowded space. Now that backstop is moving ‚out the money‘. „(…) when the herd suddenly changes direction, the result is a sharp non-linear shift in asset prices. That is a problem not only for us trying to call the market, but also for central bankers trying to remove policy accommodation at the right pace without setting off a chain reaction – especially because the longer current market dynamics run, the more energy will eventually be released.“ – bto: Je länger die Party andauert, desto größer die Kopfschmerzen. „In a fairy tale, turning points come suddenly and unexpectedly. Everything that has long been taken for granted is suddenly in pieces. In that sense markets are not all that different. People have gotten used to the paradigm that has been built up since the Great Financial Crisis. It has been tested on several occasions – 2011, 2012 and 2015 – and on each occasion central banks have overcome the challenge, thus ultimately reinforcing the regime.“ – bto: weshalb man mir immer entgegenhält, dass es auch in Zukunft so sein wird. „While our conviction in the exact timing and magnitude of the paradigm shift is admittedly low (…) it is unwavering when it comes to the broader point that central bank asset purchases will remain the key driver of markets. Exactly because trades and strategies have been built up around an assumption of the status quo, we fear that the inflection point, if / when it comes will be anything but smooth and linear. Indeed, the longer we remain in the current paradigm, the greater the chance that it ends up being both sharp and painful.“ – bto: kein Widerspruch von meiner Seite! Das alles geschieht, wenn man das Mandat der unseligen und überflüssigen Notenbanken nicht beschränkt. Diese Institutionen sind für fast alle Crashs der jüngeren Geschichte verantwortlich, denn sie finanzieren nahezu zinslos das unbegrenzte Wachstum der unproduktiven Finanzindustrie und die stetig wachsende globale Verschuldung, ohne dabei von unseren unverantwortlichen Polit-Dilettanten gestoppt zu werden. Es ist zwar ärgerlich, aber so ist es nun mal. In Japan gibt es ein vergleichbares Kapitalmarktumfeld bereits seit 25 Jahren. Überlegen Sie sich, wie sich ein japanischer Investor in dieser Zeit hat aufstellen müssen, um zu den Gewinnern zu zählen. Vergleichbar ist es nun hier. Ich würde meine Aufmerksamkeit auch auf die Schwellenländer richten, da hier noch im Laufe einer weiteren, positiven wirtschaftlichen Entwicklung ein deutliches Plus an Börsenkapitalisierung bevorsteht, was es in Europa gerade nicht mehr gibt, wo viele Indizes die einst in den Jahren 2000 und 2007 erreichten Höchststände weder erreichen noch übertreffen. Die 200-Tage-Linie – Strategie eignet sich gut für Börsenindizes, Währungspaare, Rentenmarktindizes und Standardwerte mit hoher Marktkapitalisierung. Weniger gut ist sie bei Wachstumswerten mit geringer Marktkapitalisierung und hoher Volatilität. Zudem kann man eine hohe Abweichung zur 200-Tage-Linie (mindestens 20%) zusätzlich als Signal verwenden, wenn die Gegenbewegung eintritt: Desinvestition in einer Hausse bei großer Abweichung zur 200-Tage- Linie (wie im März 2015) oder Investition in einer Baisse ebenfalls bei hoher Abweichung (wie im März 2009). Vorteil: objektive, einfache, jedoch regelmäßig zu beobachtende Kriterien zur Entscheidungsfindung mit bewiesener Überrendite zur normalen Marktrendite. Letztlich ist es eine Hilfestellung, die man stur befolgen oder mit eigenen Kriterien ergänzen kann. Der Vorteil jedoch zu kaufen-und-halten ist das deutliche Renditeplus durch Vermeidung von Verlusten. Da Nyse Margin Debt auf ATH und DAX > 200Tage müssten sie ja aktuell zu 100% investiert sein. Geben Sie einfach mal Bescheid, wenn sich das ändert, dann ist es nicht so theoretisch. Für den DAX als Index gibt es von Seiten der 200-Tage-Linie noch kein Ausstiegssignal, dafür aber bereits für viele der Überflieger – Werte gerade vom letzten Jahr wie Adidas, Fresenius, Henkel, Merck und SAP. Das kann sich aber auch wieder ändern, deshalb wenigstens monatliche Kontrolle. Ich sehe mir zudem die Charts einzeln an und benutze nicht diese Liste, obwohl sie hilfreich ist. ja, wenn’s so einfach ist, dann gibt’s ja kaum ein Risiko. Übrigens: NYSE Margin Dept korreliert zwar nahezu vollständig mit den Aktienpreisen, taugt aber nicht als vorlaufender Indikator. Trotzdem: Allen „Börsenfüchsen“ viel Glück ..
Doch, es gibt Risiko bei dieser Strategie: ca. 20% Verlustpotential sind möglich, da es – Trendfolge – eine nachlaufende Strategie ist. Beim Einstieg geht wiederum etwas der möglichen Rendite verloren, da man weder im absoluten Tief kauft noch im Hoch verkauft. Trotzdem besteht der Vorteil der Strategie darin, einen Teil der Negativrendite von Kursrückgängen auszulassen, wodurch sich die Mehrrendite zum buy-and-hold Ansatz ergibt. Jedem aktuell nicht investiertem würde ich auch jetzt nicht zum Investieren raten, sondern dazu, ein neues Einstiegssignal (wie zuletzt im August 2016) abzuwarten. Zumal aktuell (s. o.) bereits einige bekannte Werte aus der 200-Tage-Linie gelaufen sind, was beispielsweise vor genau einem Jahr so nicht der Fall war. die 200Tg Linie laesst sich auch fuer ETFs (mittelgrosses Weltdepot) anwenden vermute ich? Wird dies “ https://fred.stlouisfed.org/series/t10y2y “ ebenfalls als Indikator verwendet (werden koennen)? Für einen ETF – Investor ist die 200-Tage-Linie als Signalinstrument erste Wahl, da auch von einem Berufstätigem mit wenig Zeit (z.B. am Wochenende) anwendbar. Dies hat als Signalinstrument 2000 und 2007 funktioniert. Aktuell steigen die kurzfristigen Zinssätze auch wieder, ohne aber bisher das Niveau der 10- bis 30-jährigen Anleihen erreicht zu haben. Relativ zur Geldmenge sind Aktien sehr günstig. Sie können sich noch vervielfacht. Geld hat einfach keinen Wert mehr. Alles wird im Preis und Wert steigen. Der gedankliche Fehler in Ihrer Aussage liegt darin, daß Sie die heutige Profitabilität, Gewinnwachstum und Bewertung der börsennotierten Unternehmen quasi in alle Ewigkeit fortschreiben. Ein Umsatzrückgang von 10% bis 20% kann den bisher erzielten Jahresgewinn halbieren oder in einen Verlust verwandeln (z.B. wegen Abschreibungen auf zuvor teuer gekaufte Beteiligungen). Paradebeispiel aus der jüngeren Zeit: Microsoft kauft die Handysparte von Nokia. Gerade die nun wieder ansteigenden Zinsen sind Gift für alle, die bisher hohe Buchgewinne wegen dem bisher stets gesunkenen Zinsniveau erzielten, wie beispielsweise Immobiliengesellschaften („Aufwertungsgewinne“). Ich weiß zudem nicht, von welchem Geld, welcher Währung Sie reden, das angeblich keinen Wert mehr hat. Vergleichen Sie den Wert Ihres Geldes einfach mit der Wertentwicklung des russischen Rubels, des brasilianischen Reals oder des südafrikanischen Rands während der vergangenen 5 Jahre, in denen es zudem noch hohe Zinsen auf diese Währungen gab. Oder mit dem venezulanischen Peso. Geht’s noch schlimmer? In den USA wird Amazon mit einem KGV, gemessen am letzten Gewinn. von 332 gehandelt gemessen am erwarteten zukünftigen Gewinn von 164. Und Bezos wird in den deutschen Medien als eine Art Messias der Wirtschaftwelt gefeiert, das Problem ist Amazon ist ein Umsatzriese und Gewinnzwerg die Marge liegt bei mickrigen 1,5% nach Steuern. Meine Vermutung beim nächsten Crash knallt die Aktie um 80% nach unten, da jetzt schon hoffnungslos überbewertet. Für mich gilt liquide Mittel rauf, nur in Aktien investieren die ein vernünftiges KGV haben in den USA sind das derzeit überwiegend die Pharmawerte (mit den entsprechenden Risiken). Gold nicht physisch sondern in ungehdgten Minenaktien (risikoreich). Die liquiden Mittel nicht in Euro, Dr. Stelter bevorzugte ja wenn mich recht entsinne GBP ich finde CHF zu den derzeitigen Wechselkursen zum Euro interessantet. Als Sahnehäubchen einen Short Dax ETF als eine Sparplan mit festen Beträgen in regelmäßigen Abständen. DIe Party wird wahrscheinlich länger dauern als man vermutet aber man kann mit dem warm anziehen ja schonmal anfangen. Marc Faber soll ja gesagt haben wer bei nächsten Crash nur 50% verliert ist schon unter den Gewinnern. Irgendwann demnächst wird sich das auch wieder korrigieren bzw. in einer Baisse zu einem Zustand der Unterbewertung wechseln, vergleichbar wie in 2003 und 2009. Diese durchschnittlichen, hohen Wertezuwachs gibt es eben nur in Haussejahren. So mit ist es wichtig, die Wertverluste von Baissejahren zu vermeiden. Siehe dazu meine weiteren Beiträge. Ich denke sie haben Amazon nicht verstanden und auch nicht dessen Bewertung. Amazon hat im Grunde noch nie großartige Gewinne gemacht, weil man ständig investiert hat um das Geschäft aufzubauen. Amazon und Alibaba teilen sich weltweit mittlerweile 2% (!) des gesamten globalen Onlineumsatzes auf, davon kriegt Amazon den größeren Teil. Zudem ist Amazon führend im Cloudgeschäft, vor Microsoft und Google und wird mit seinen Web Services die 100 Milliarden Umsatzmarke in wenigen Jahren knacken, der Etrag in diesem Teilgeschäft ist jetzt schon außerordentlich. Geben Sie einfach zu das sie von Bewertung keine Ahnung haben, ein KGV allein sagt nämlich überhaupt nichts aus! Amazon ist teuer keine Frage und da kann auch mal eine 20% Korrektur über 2 Jahre anstehen, aber 80% ist außerhalb jeder Möglichkeit.